Lose the light bulbs as start installing Ross Lovegrove’s gorgeous VELUX sun tunnel lamps for an illuminating green space lit by the sun! 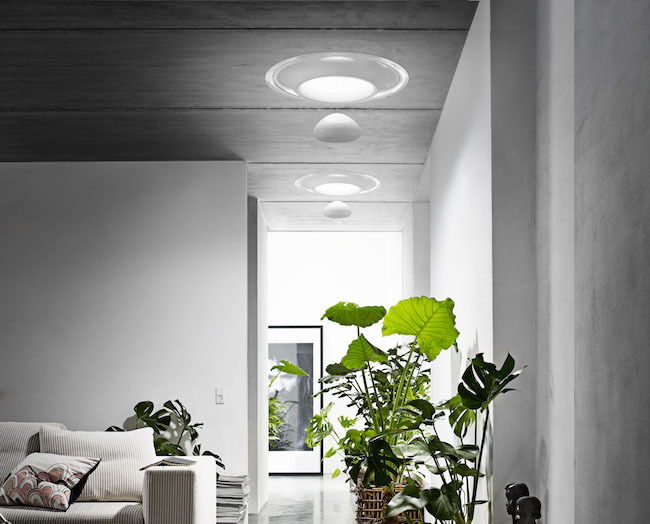 The VELUX sun tunnel is a lovely drop pendant lamp that uses the sun as its bulb, making it a sustainable alternative to electric lighting. The lamp generates as much light as a 60 Watt incandescent, can be angled and adjusted for intensity, and will even work without fail on a cloudy day. And with a simple yet stylish design, the lamp will mesh well with any interior decor. What an ingenious idea, and the design is outstanding. it looks like its floating!!! but will it work in the dark? I love the idea of daylight tubes. I have them in every room of my house if I could afford the installation cost. Lose the light bulbs as start installing Ross Lovegrove's gorgeous VELUX sun tunnel lamps for an illuminating green space lit by the sun! The VELUX sun tunnel is a lovely drop pendant lamp that uses the sun as its bulb, making it a sustainable alternative to electric lighting. The lamp generates as much light as a 60 Watt incandescent, can be angled and adjusted for intensity, and will even work without fail on a cloudy day. And with a simple yet stylish design, the lamp will mesh well with any interior decor.